No longer are philosophers and scientists the primary spokespersons for atheism. 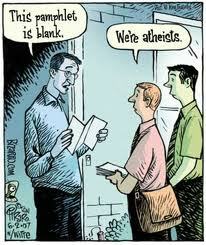 Instead of atheist thinkers emerging and pushing thinking forward, most modern atheists are captivated by comedians. That’s right, the best atheism has to offer is not the arguments of renowned philosophers or historians instead it is memes (ironic since Dawkins first coined the term) and comedy pseudo-apologists. Only ONCE has an atheist ever recommended Bertrand Russell to me and it was worth my time 100 fold the many many comedic clips and memes that have been toted as great wisdom. Now this is not to say atheism is lacking in its thinkers or even that it is non-thinking. As a matter of fact psychologists have found a strong correlation between humor and intelligence. But what exactly does this mean? Humor and intelligence are intricately linked. It does not mean that comedians are right, as we know humor often has nothing to do with reality. Also truth has to correlate to reality or it is not truth. Atheists in general(and i’m referring to outspoken public figures) present atheism as intellectually superior to religion and as a big step forward for humanity. Then way is humor at the forefront over real arguments? Whose views are you more familiar with? Michael Shermer or Ricky Gervais? Bart Ehrman or Bill Maher? Friedrich Nietzsche or George Carlin? If you actually believe atheism is true you should be answering the former in all these questions. Now of course none of this is to say that humor can’t be accurate and true. But the interesting thing is that most of our understanding of humor indicates that its an “emotional regulator” of sorts. It literally helps to regulate emotions in a number of beneficial ways. And those with better emotional regulation are often those with a better social intelligence. This is a far cry from Plato’s take on the subject though, “No composer of comedy, iambic or lyric verse shall be permitted to hold any citizen up to laughter, by word or gesture, with passion or otherwise”. Now, I personally see philosophical depth in comedy. Comedy can often be a means of softly or bluntly pointing at truth as well. And this is well and good. Given my own affinity for sarcasm I am certainly glad that most don’t write of comedy in the same way Plato did. But with all that said I think there is some subtle and thought provoking issues underlying this trend that people should consider before taking any argument guised in humor to seriously. How often is humor being used as a shield to deflect critical thinking or to hide behind for some other reason? This goes back to our look at humor as an emotional regulator. If humor is making us feel better or encouraged in a particular belief then perhaps we should consider why. Are we influenced because it makes light of a heavy issue? In many cases I often find myself saying yes to this. I have a very dark sense of humor and this helps me to cope with much of the horror I see in the world. Does this negate my take on why evil exists? Absolutely not. But I have to be careful that I don’t take humor as my only approach and actually take time to seriously consider why the world is the way it is. When humor is the primary or only response to issues like this it can easily become a shield to deflect honest skepticism and doubt of various worldviews and perspectives. Does the humor of your favorite comedian work because it deflects you from considering the validity of another viewpoint? Do you resort to humor or cynical comparisons when challenged? If we are honest I think we all do at times. But to hinge on these approaches continuously can lead to a dangerous suppression of seeking truth (see also Signs of Fearing the Truth). Humor serves another purpose, as a weapon to challenge the status quo. This I find as far more beneficial in many ways as I think we should all be open to challenges in our views. Doubt is not a bad thing if we are truly seeking truth from the reality in which we live. However, with that said we again see pitfalls when the humor is used to wield some invalid point. When this happens we may found ourselves engrained with invalid information that doesn’t actually serve us any true intellectual benefit. For example, the ministry of Answer in Genesis uses cartoons throughout their material in a way that brings in mockery of alternative view points. This would be fine but they frequently mischaracterize other views and rarely direct towards the actual issues at had vs. taking a quick jab at a strawman. They then fill their social media and material with cartoons rather than allowing their material and “evidence” to stand for its self. This is especially disturbing in their children materials. There are showing children how to take jabs at a strawman version of evolution. Rather then focusing on the critical thinking it actually take to investigate the evidences. But enough on that…for more on AiG see my prior article on the subject (Questionable:Answers in Genesis). Now, AiG only serves as one example on the Christian side where I see this. Lets take a look on the other side of the fence at Bill Maher’s “Religulous”. This documentary was actually the start of this article as I considered going through and doing a point by point refutation. However, after re-watching for the 3rd time I realized that the point of this comedy was to sew doubt by showing a strawman of Christianity(which 75% of the movie focuses on). The goal was never to create an actual well thought out refutation of Christian beliefs the goal was using comedy as the weapon in hand. I’m all for the challenge but Religulous was filled to the brim with false information and caricatures that were poor representations of the beliefs they were actually attacking. The infographic of the horus and mithra similarities to Jesus alone created a pop-atheism argument that was based almost entirely on false information. This does not help to further a genuine truth seeker. All these points do not refute any individual and they certainly don’t refute comedy as a valid means for furthering an argument. But what I hope they do is draw your attention to how humor and comedy may be influencing your worldviews and emotions. There is no one size fits all prescription for balancing humor in your life which is really the whole point of this article. We all need humor in various forms but how are we using and perceiving it? Is it shielding our emotions from having to face the truth of reality? Is it a weapon for us to use as a battering ram to other’s views without consideration of the facts? Or maybe it is our total escape pod from actually having to consider evidence at all. And those my friends are challenging punch lines you have to ask yourself.